Born Stephen Lawrence Suffet in 1947, Steve Suffet is best described as an old fashioned folk singer in the People's Music tradition. His repertoire is a mixture of railroad songs, trucker songs, union songs, old time country music, blues, ragtime, Gospel, topical-political songs, and whatever else tickles his fancy. He takes songs from whatever sources he wishes and then he sings them his own way, maybe rewriting the lyrics on the spot or changing the music to fit his own particular style. Steve returned to the folk scene when invited to perform at a Sis Cunningham Tribute Concert in 1997. Since then he has played for festivals, clubs, and folk music societies throughout the northeastern USA. In 2007, Steve made his first appearance at the Jacob's Ladder Folk Festival in Israel. 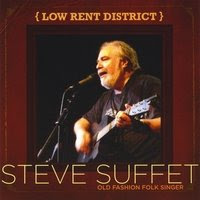 "Low Rent District" is Steve's third full CD. It eighteen tracks include eight of Steve's own compositions, four traditional folk songs that Steve arranged, a cowboy song from 1911, a Carter Family song, a song by contemporary songwriter Si Kahn, two little known Woody Guthrie songs, and Guthrie's version of a traditional Gospel song. SoundClick music page. The other two are "Wishes" and "Bring Our Soldiers Home." and mixing, and it is not worth the expense.